Mark Goldberg made a fortune in the dot-com bubble at the end of the nineties. Following the sale of his IT recruitment consultancy, Goldberg, then 33, became a multi-millionaire and decided to fulfill his boyhood dream of buying his beloved Crystal Palace. At the time Palace were floundering at the bottom of the Premier League, and the price he paid - roughly £25m, which crucially didn’t include the freehold of Selhurst Park - was widely regarded as overblown for a club that were odds-on to go down. Goldberg’s first move as Palace chairman was to relieve Steve Coppell of managerial duties and appoint Atillio Lombrado and Tomas Brolin as joint player-managers; no matter Lombrado didn’t speak any English and Brolin was by now a very poor player and slightly unhinged. Of course I don't think my beloved Aston Villa have a hope of winning the Premiership. Of course not. The bookies odds of us still at 50-1 before the weekend reflect the unlikelihood of this occurrence and they tend to know what they're talking about. However, it is great to be in the mix. I never really thought we would be again in the current climate, especially with the woeful duo of Doug Ellis and David O'Leary running the show a few years back. Randy Lerner's cash and Martin O'Neill's brilliant management have put us right in amongst the big boys and even though we probably won't last the pace, I can dream. 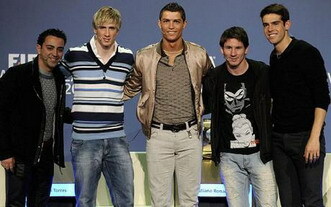 Ronaldo, Kaka, Messi, Torres, Xavi - Say cheese! Taken last week at the FIFA World Player of the Year awards here we have ‘officially’ the five best players in the world, standing arm-in-arm, casually decked out for the occasion. It can be disconcerting to see people you are familiar with in a professional capacity outside of work. Like the time I saw my old school teacher in the frozen-food aisle at ASDA with his mildly attractive younger wife. Something about the whole situation just wasn't right. And there's something unerring about this picture. I think it's that outside of their usual context footballers are an odd bunch. A brilliant individual goal from Lionel Messi got the weekend's Liga scoring underway. 20 minutes had passed in the Camp Nou when Messi - free on the right - could , and perhaps should, have played Eto'o clear through on goal. Instead he chose to continue a diagonal run across the box and away from goal. With Deportivo defenders surging back, the chance looked wasted, but all of sudden the most lightly hit shot was creeping it's way past keeper Aranzubía, at an angle only Messi had invisaged. It was to be that sort of night for Barcelona as they hit top gear and went on to wrap-up a 5-0 win with braces from the 'back to his best' Henry and Liga top scorer Samuel Eto'o. I had planned on Saturday evening to watch Arsenal with some optimism as I was quietly confident that they would continue their recent good form with a revenge victory over Hull City on Setanta TV. Instead the opportunity arose for me at the last moment to take a ticket for the simultaneous fixture being played out on Sky TV, with Bristol City hosting Wolverhampton Wanderers in the Championship.